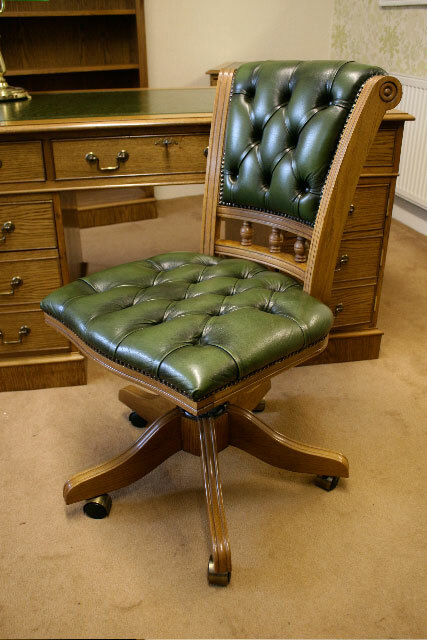 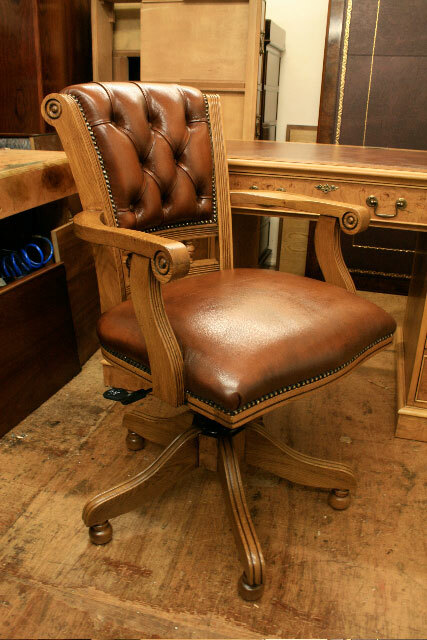 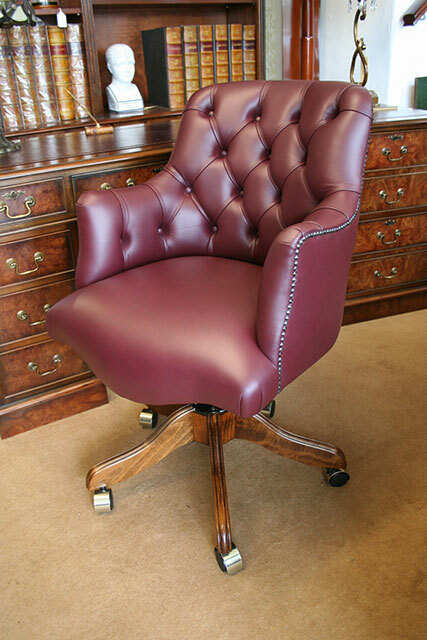 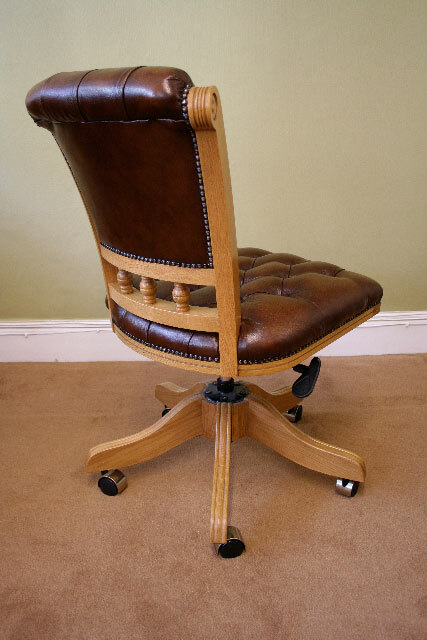 Our comprehensive range of Traditional Leather Desk Chairs, are hand upholstered here in the UK by our own upholsters (not imported). 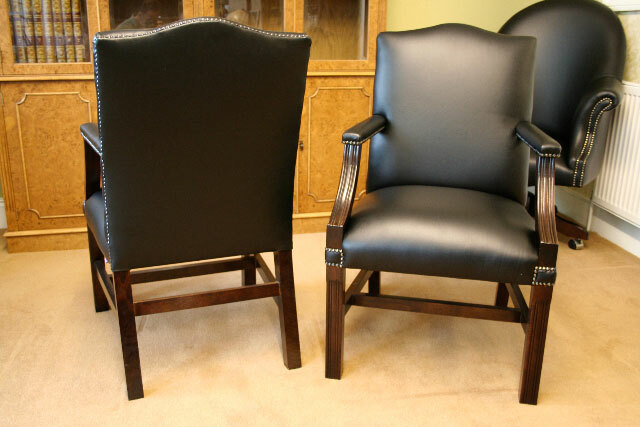 The Hardwood Chair Frames are first polished to any chosen wood shade. 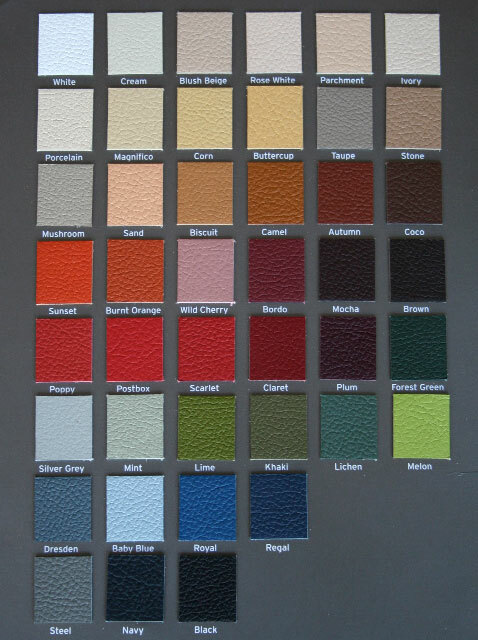 The Chairs are then upholstered in a choice of antique, or pastel coloured hide leathers. 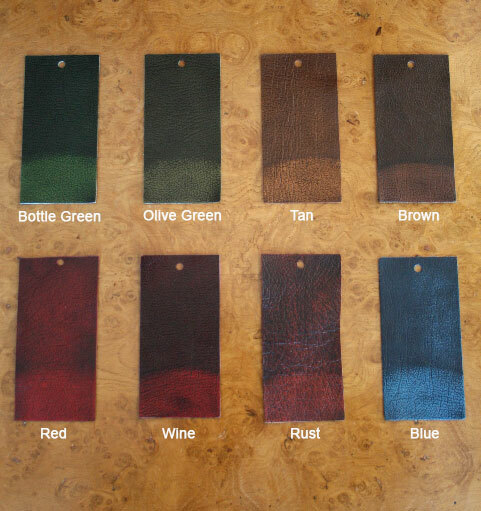 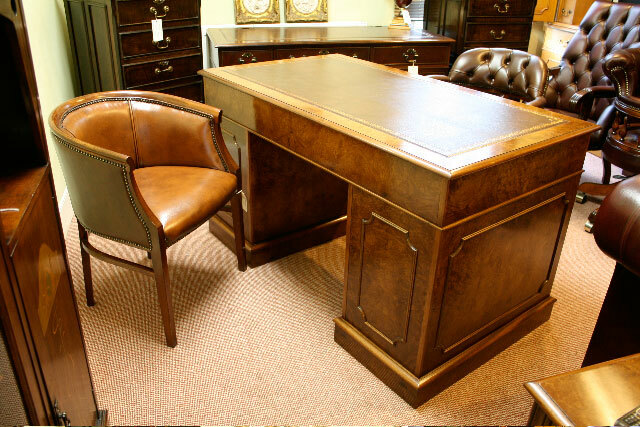 The antique hides have a darker top colour that is carefully highlighted to give the authentic antique appearance. 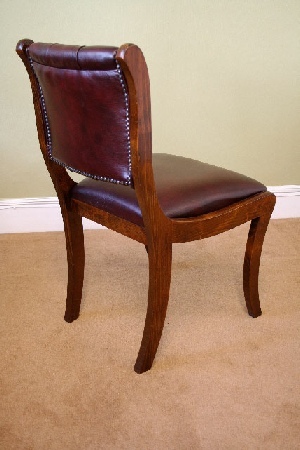 There is then a choice of Upholstered Seat Options. 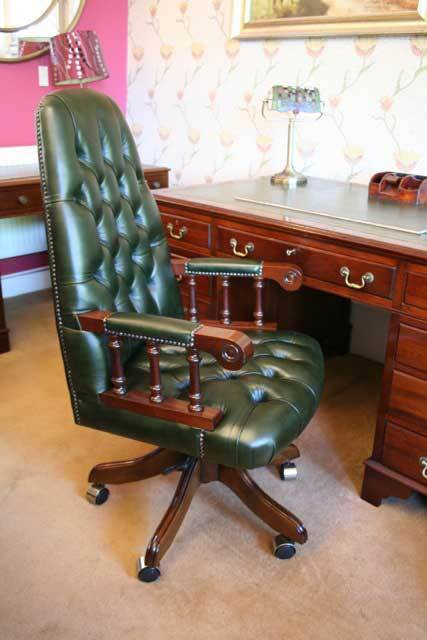 DC 047 Regency Single Desk Chair Polished Top Rail. 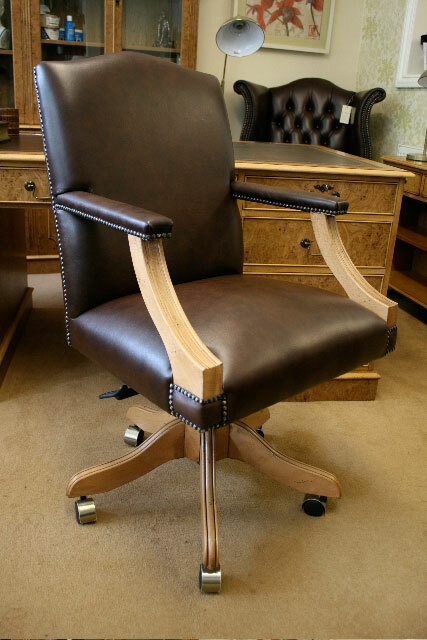 A versatile Single Desk Chair made with a polished top back rail. 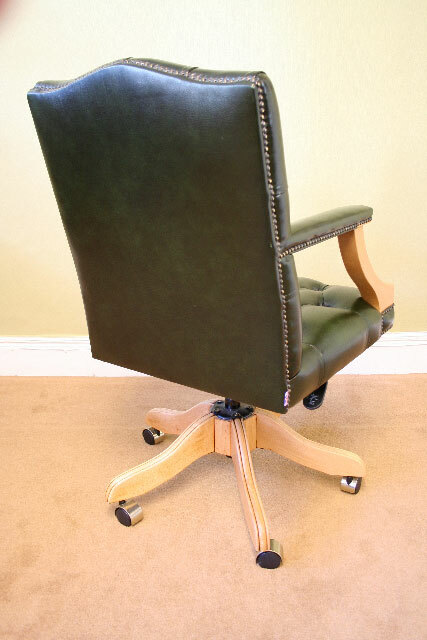 Ideal for use with a Small Desk or can be used as Reception/ Boardroom Table Chairs. A popular Single Desk Chair that can be tucked into the Kneehole space of most Desks . 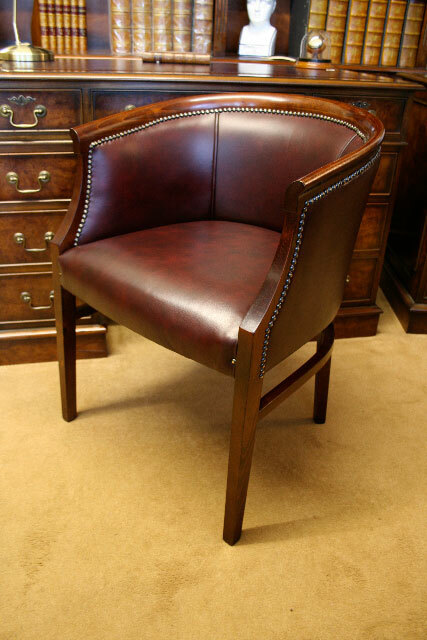 Upholstered back and seat making it a comfortable small chair. 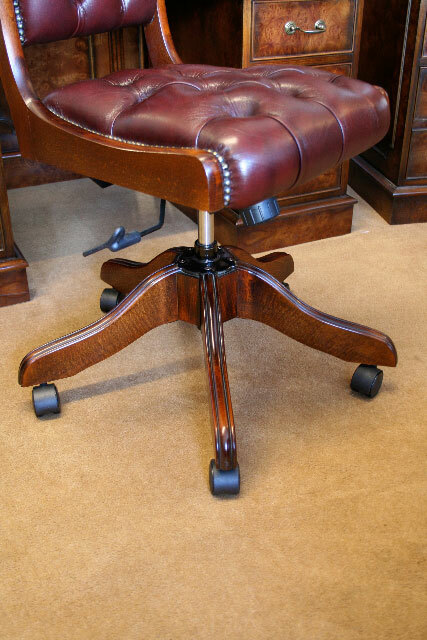 DC049 Belmont Swivel Desk Chair. 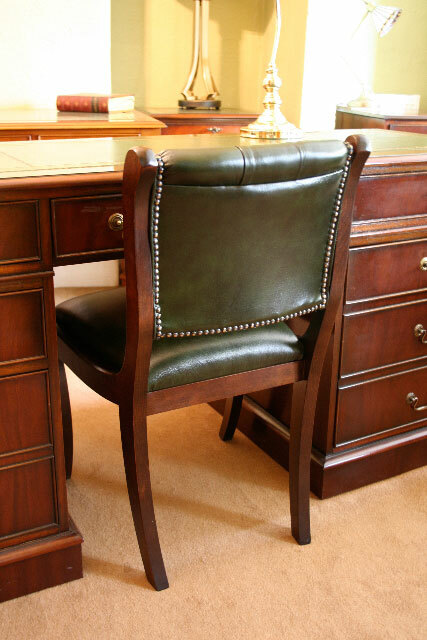 The Belmont is a small Swivel Desk Chair. 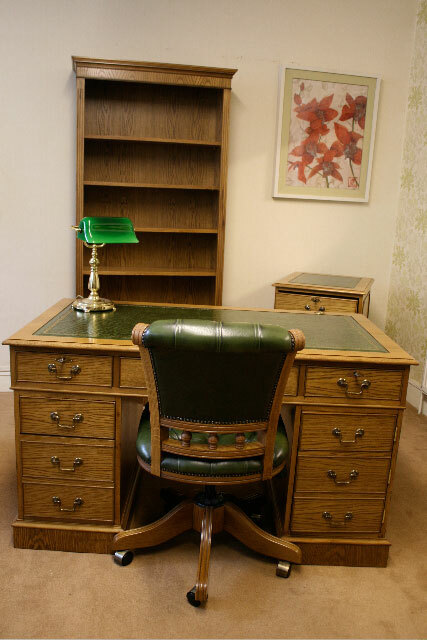 It works well with smaller Pedestal Desks. A rounded back Tub chair. 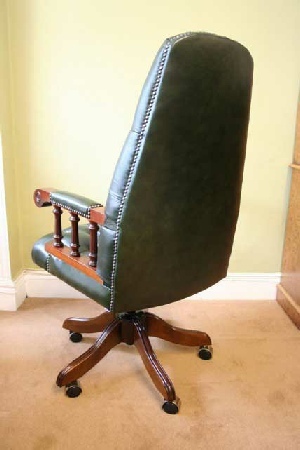 Can be used as a Desk chair or used as a Reception Chair. 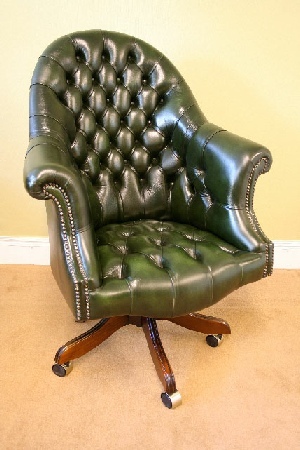 Only available in plain upholstery (not buttoned) as shown. 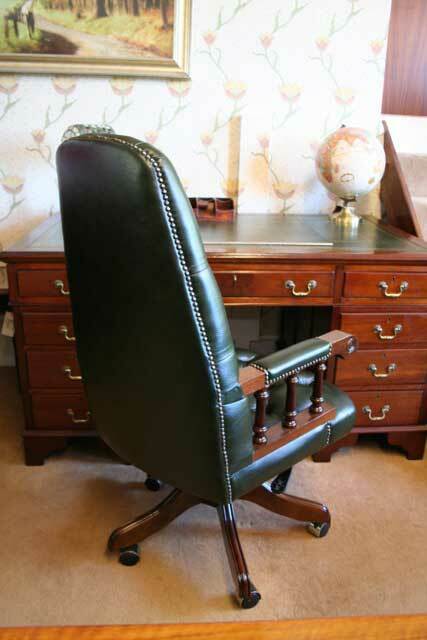 DC051 Typist Single Desk Chair. The same design as the our Regency Single Chair but with a Swivel Base and GAS adjustable tilt mechanism. 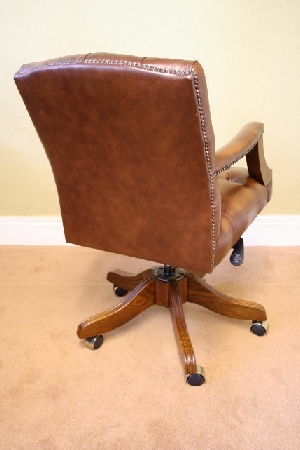 Without the arms the chair can be pushed into the kneehole area of a Desk. 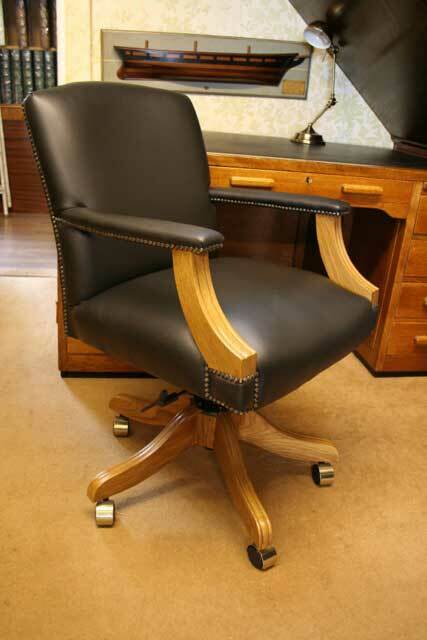 DC051C Typist Carver Desk Chair. 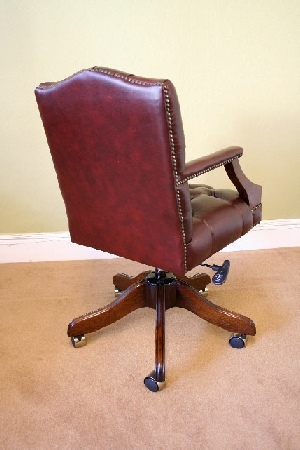 As the Typist Single Swivel Chair but with Scroll shaped arms. 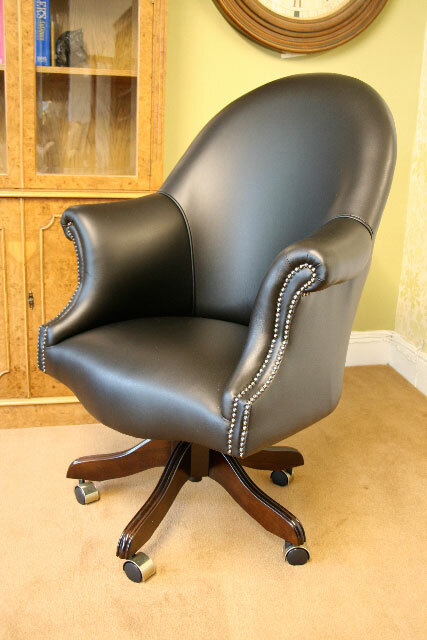 The comfortable curved back Court Swivel Chair is great alternative to the Captains Swivel chair. 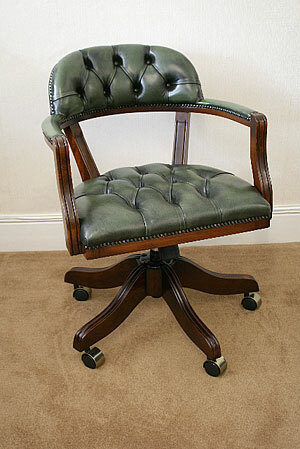 DC054 Captains Swivel Desk Chair. 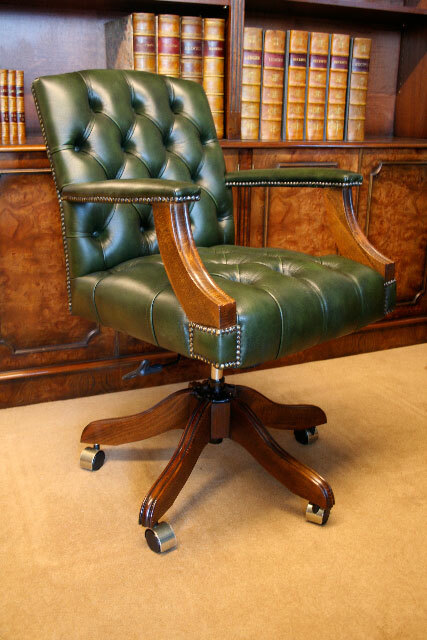 This timeless classic Desk Chair has been a firm favorite in studies and offices over the decades. A comfortable curved back support above turned wooden spindles. Most of our chairs are supplies with Twin Wheeled Brass Hooded Castors. 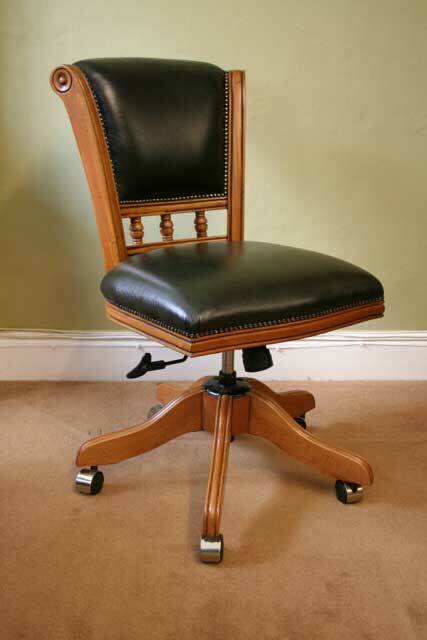 Black castors can also be fitted. 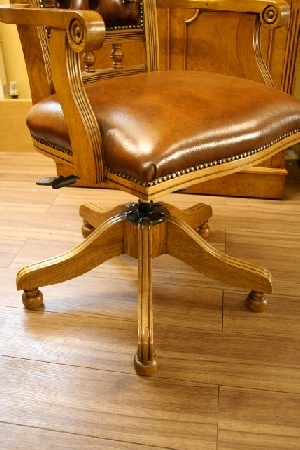 There is also a no cost option of have Turned Wooden feet with felt pads underneath, polished to match the chair base. 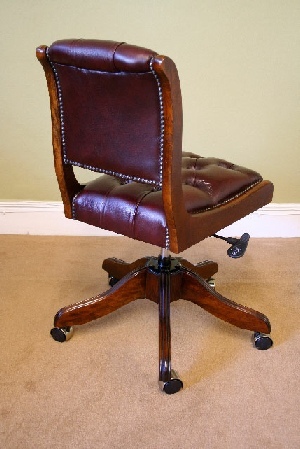 All Swivel Chair Bases have a Gas lift and tilt Mechanism fitted. The Viscount Single Desk Chair, made with no arms which allows the chair to tuck into the kneehole area of most Pedestal Desks. 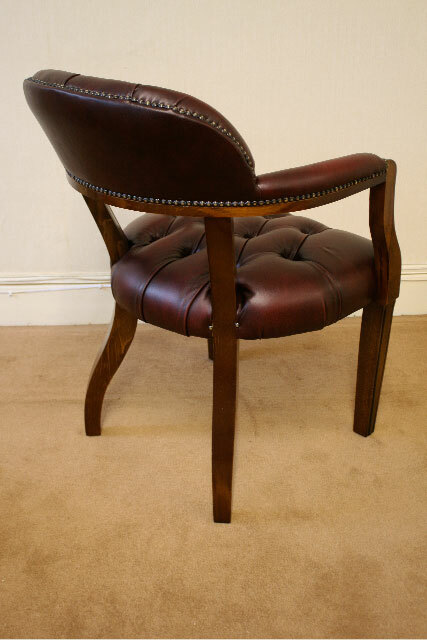 Small wooden turnings between the back rest and the comfortable wide seat with fluted face edge detailing add to the stylish design. 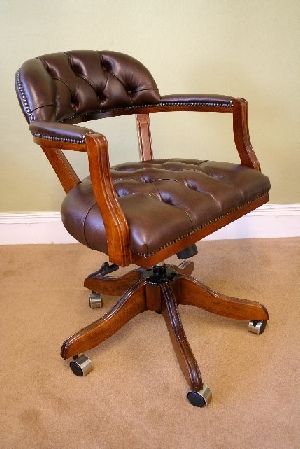 DC 055C Viscount Carver Swivel Desk Chair. 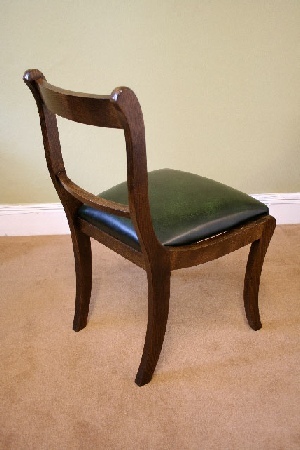 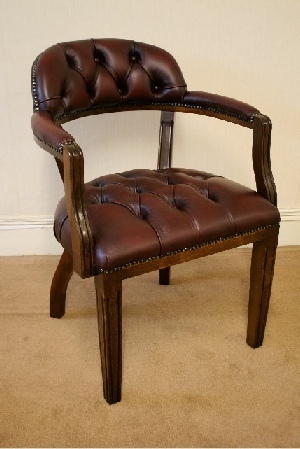 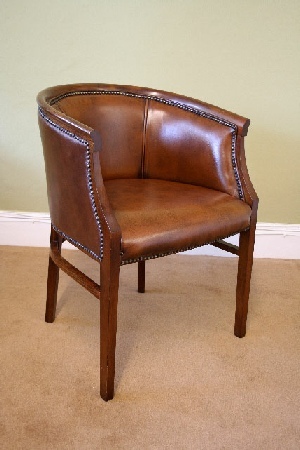 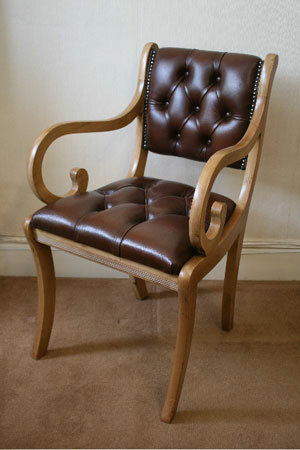 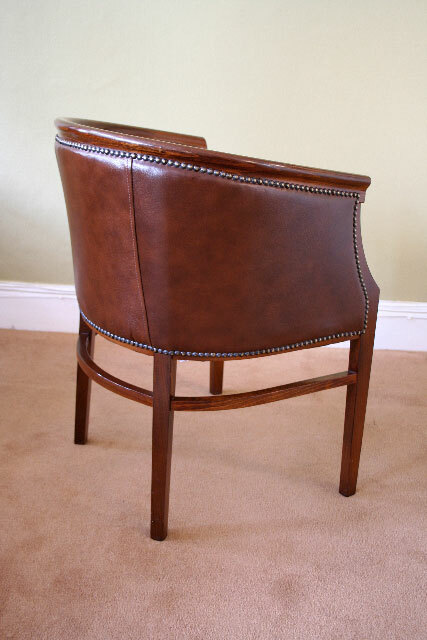 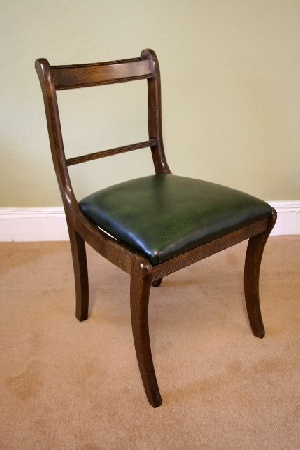 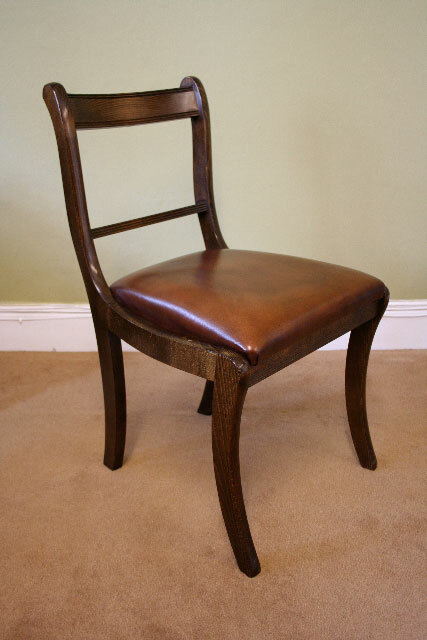 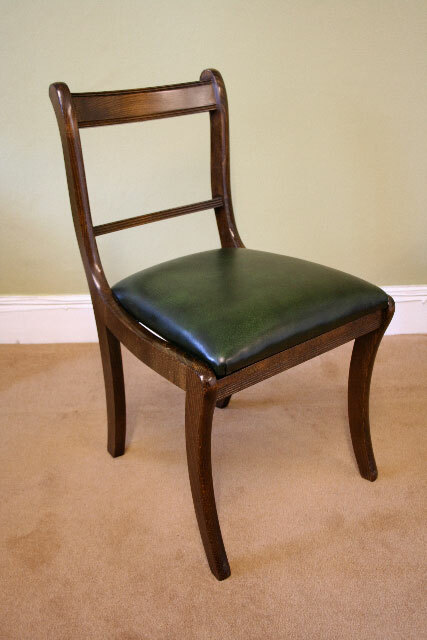 The same design as our Viscount single chair but with shaped Wooden arms. Add £45 to upholster the arms with leather padding. 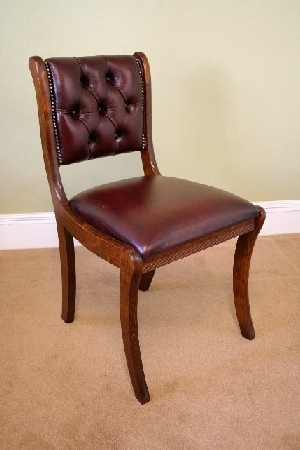 The Gainsborough Chair is a period design that has been popular since the eighteenth century, with a generous wide seat, open sides, padded arms and a high back. 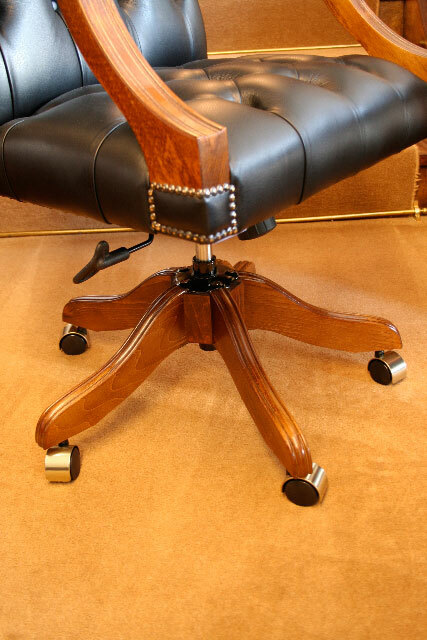 Wooden stretchers between the legs increase the strength of the chair. 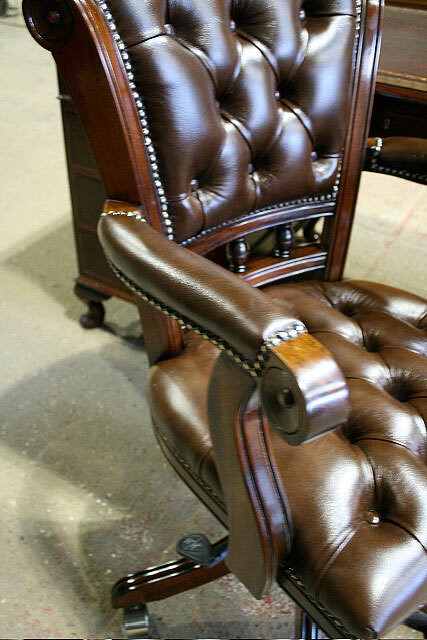 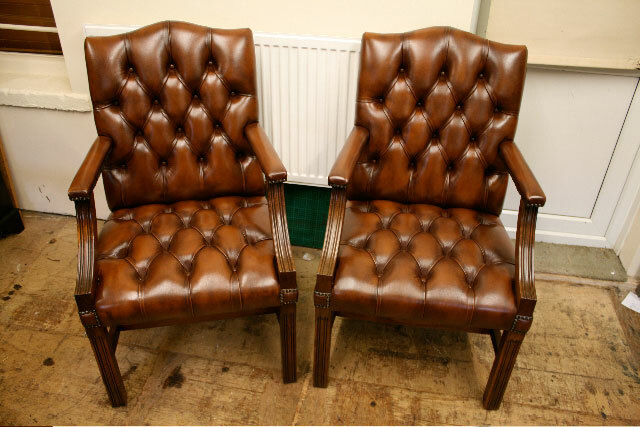 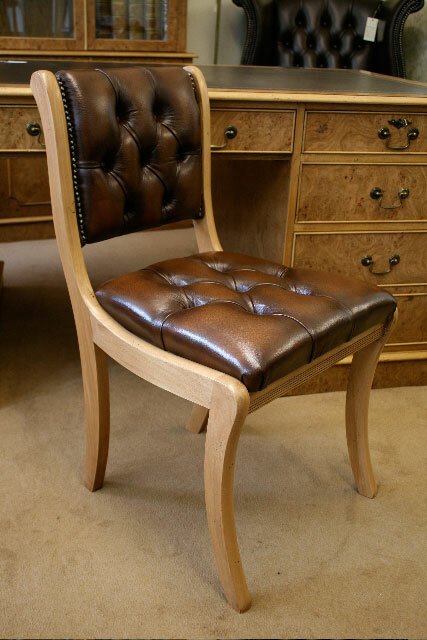 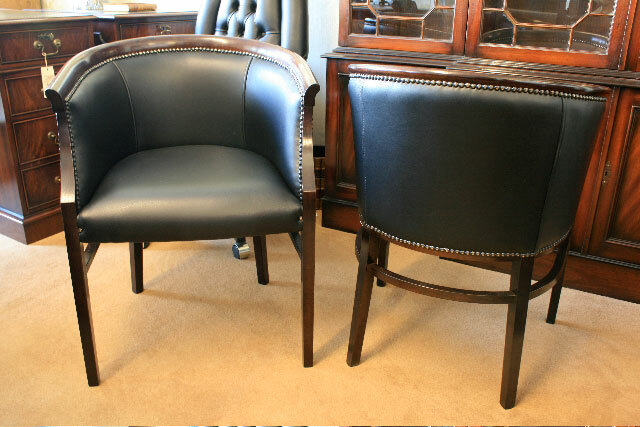 As with all our chairs there is a choice of plain or buttoned upholstery and various wood finishes to choose from. 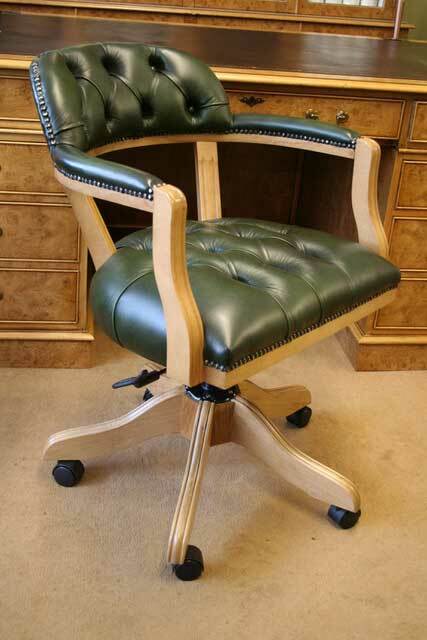 DC057 Gainsborough Swivel Desk Chair. 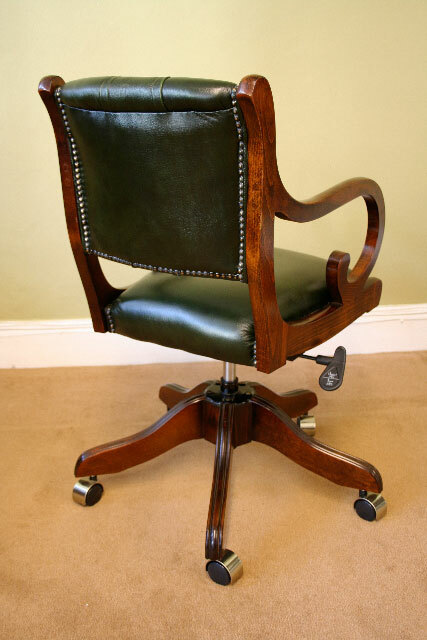 The same design as the Gainsborough Chair but with a Gas height tilt and swivel adjustable base. A popular Swivel Desk Chair, that works well with medium to larger size Desks. 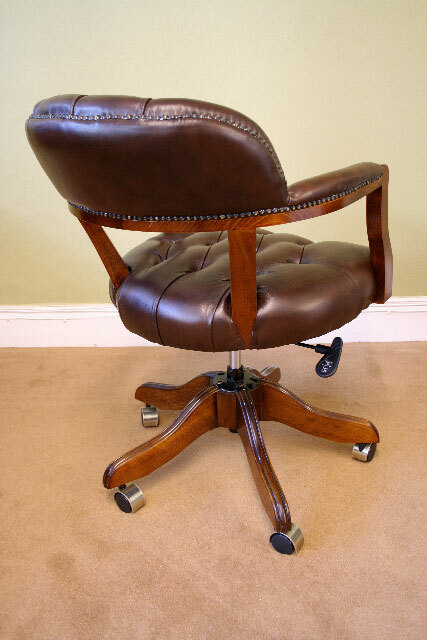 DC058 Richmond Swivel Desk Chair. 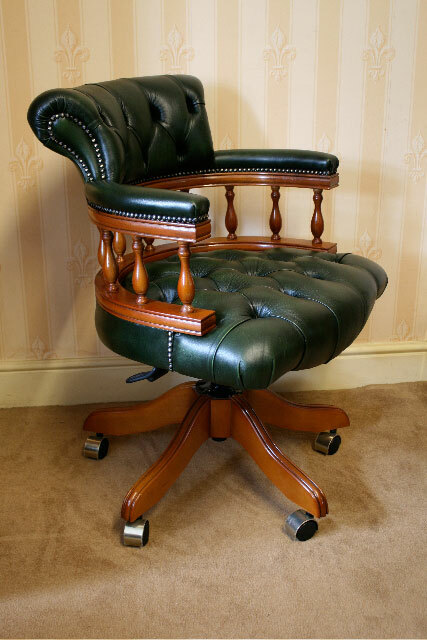 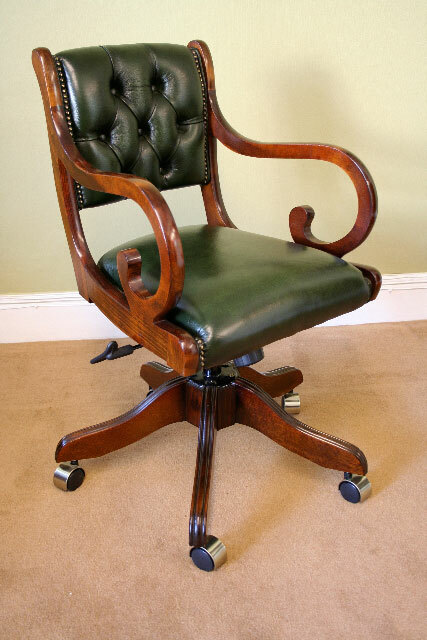 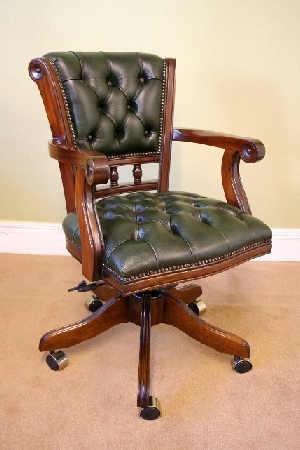 The Richmond Swivel Chair is similar in design to the Gainsborough Swivel chair, but smaller in height and width with an arched back rest and curved arms. 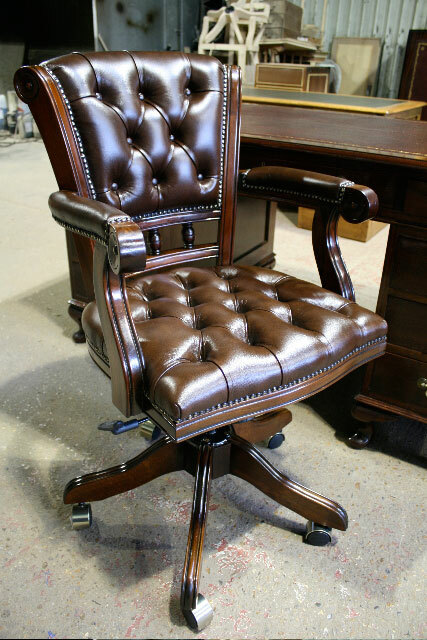 DC059 Ascot Swivel Desk Chair. 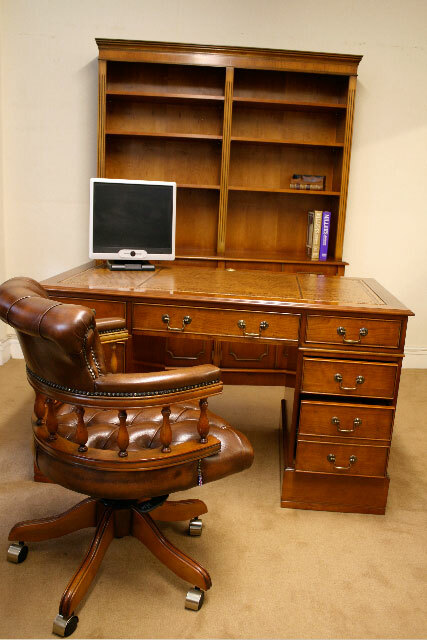 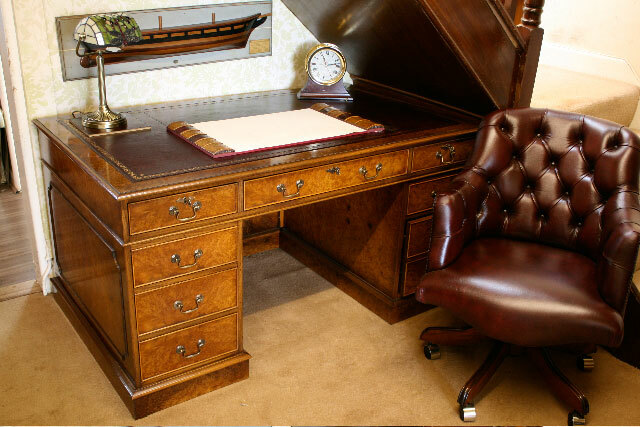 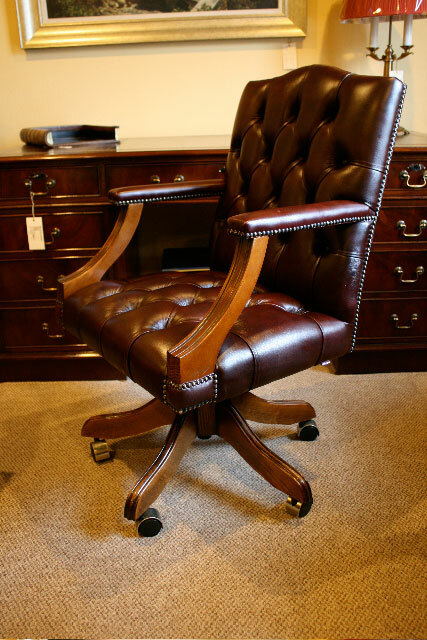 The elegant high back Ascot Swivel Desk Chair with it's turned wooden spindles supporting the padded arm rests, a comfortable wide seat and angled back support, is best suited to a larger Desk. 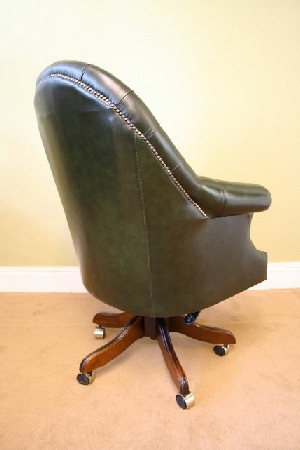 DC60w Williams Swivel Desk Chair. 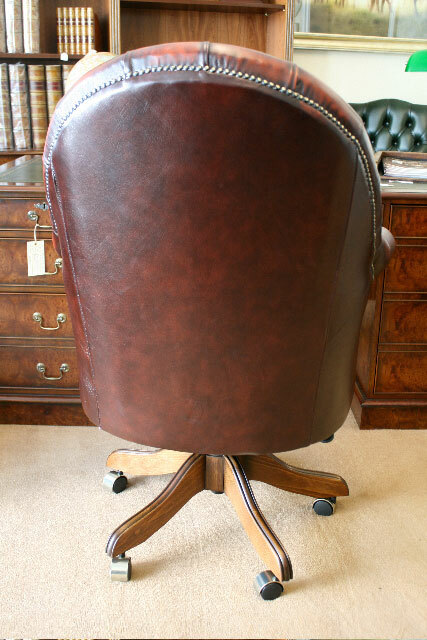 A comfortable fully upholstered, curved back Desk Chair. 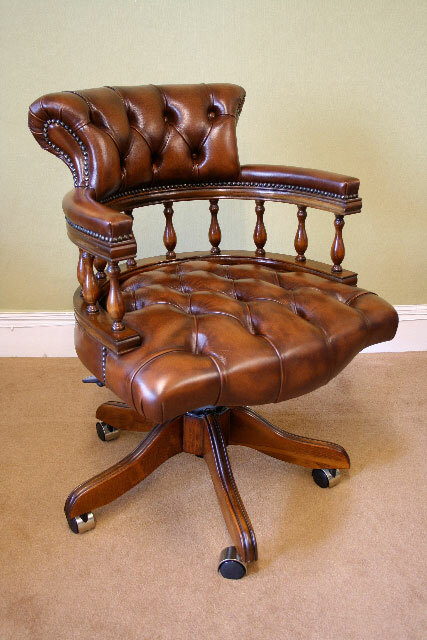 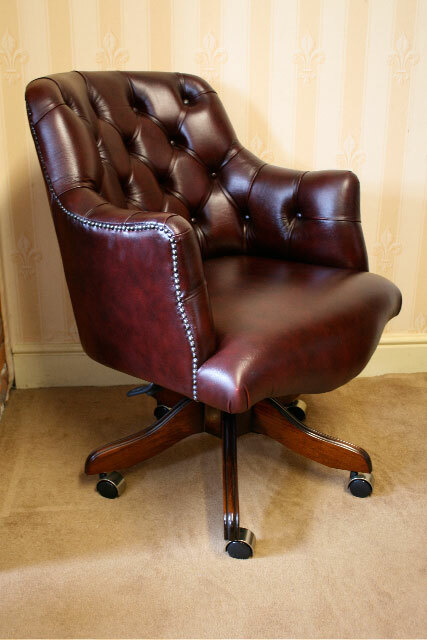 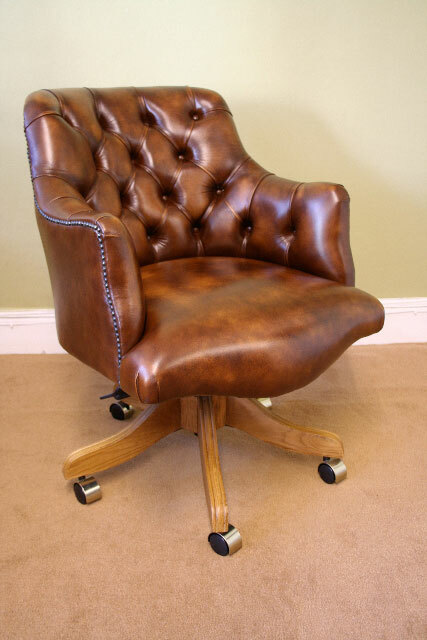 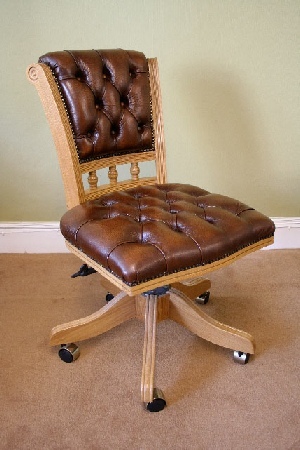 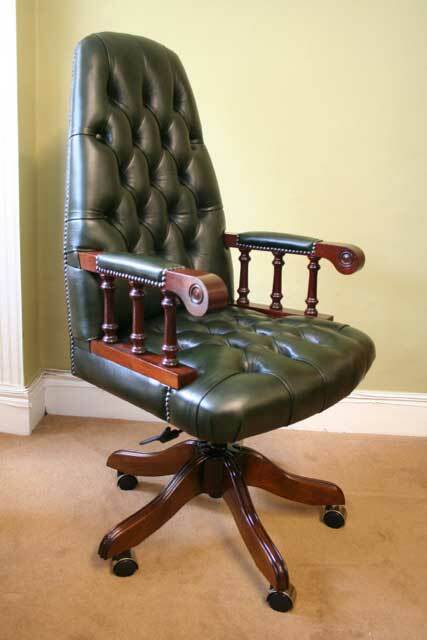 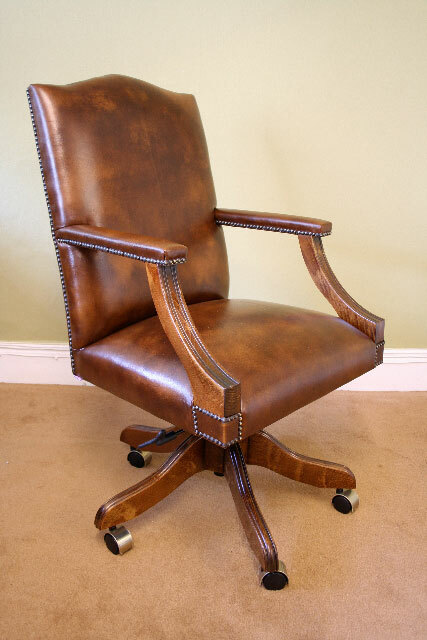 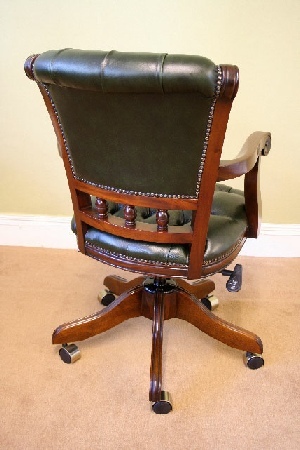 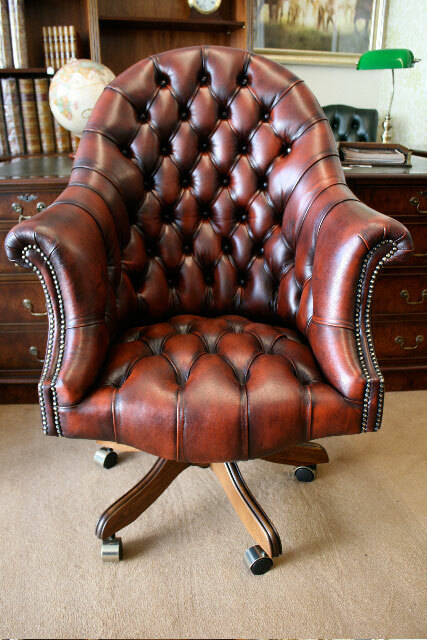 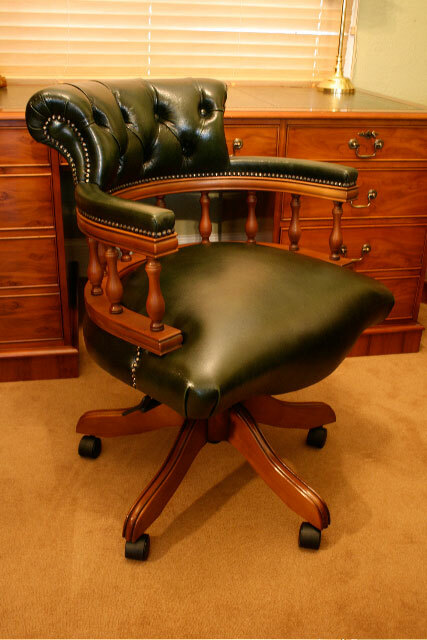 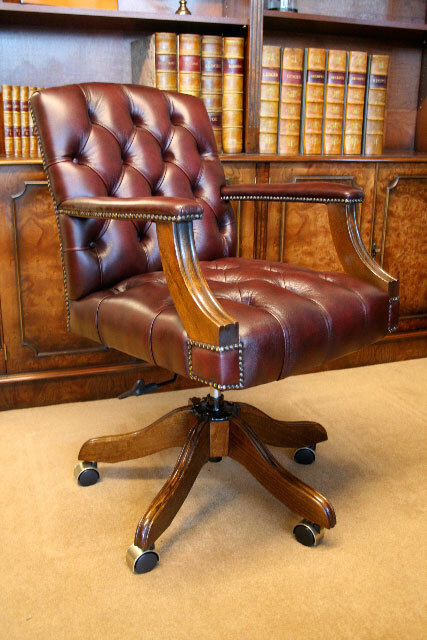 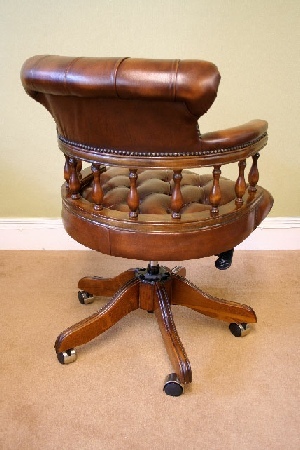 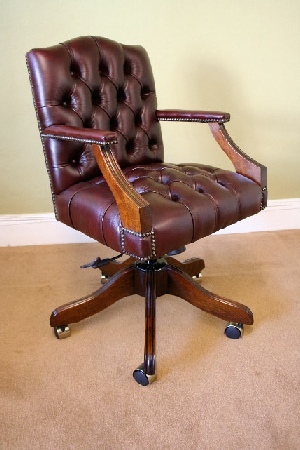 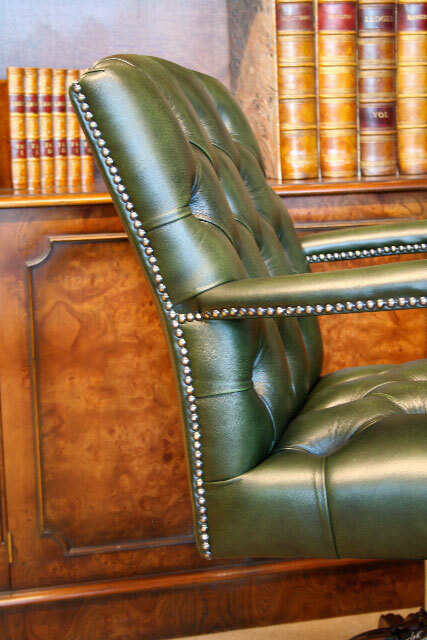 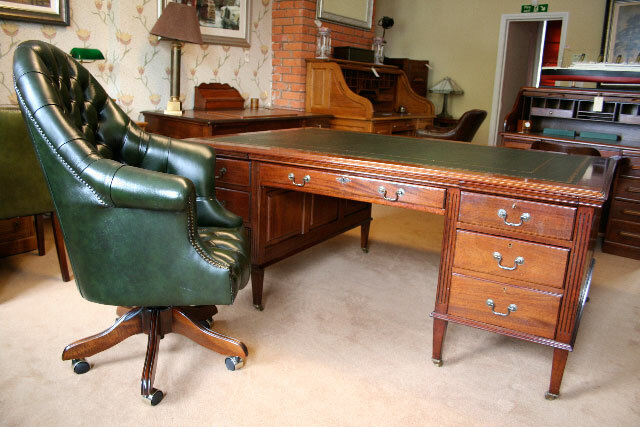 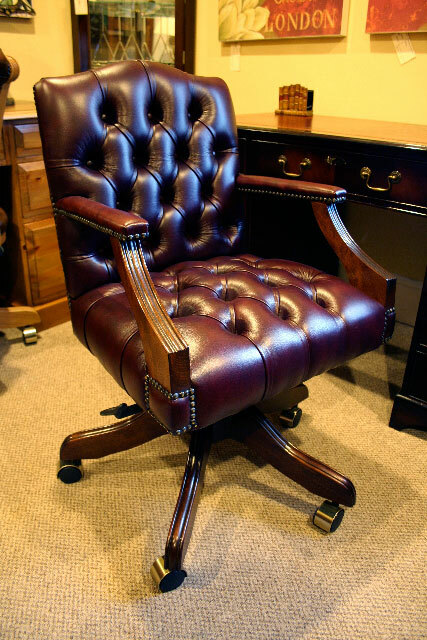 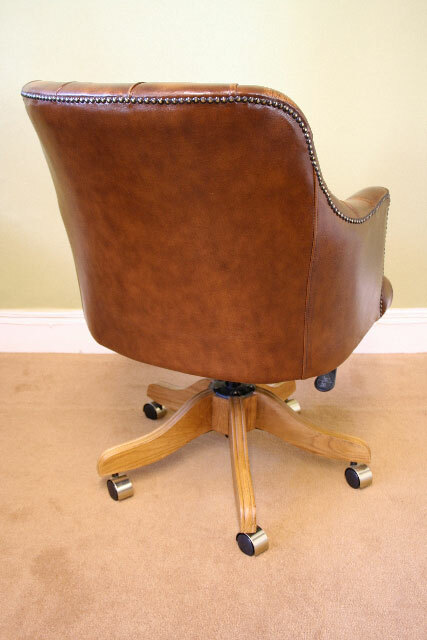 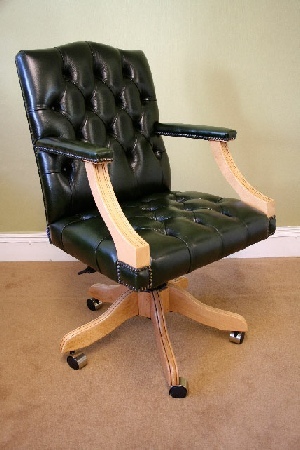 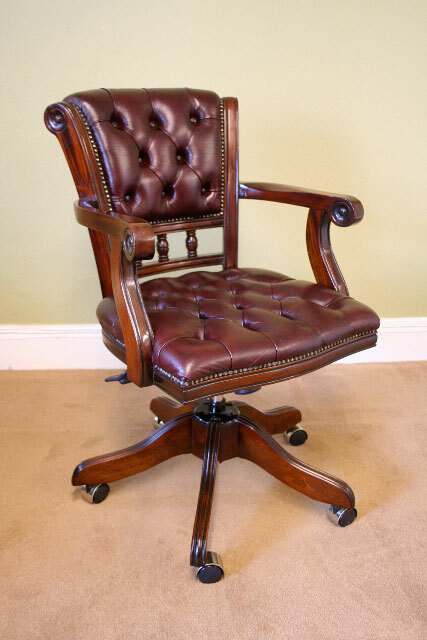 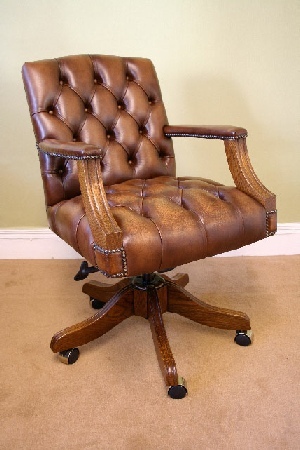 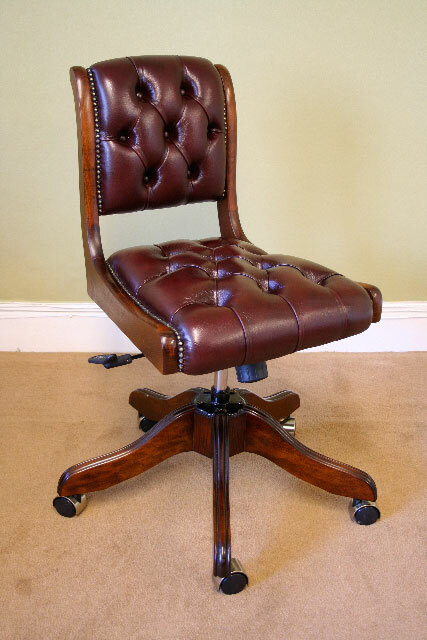 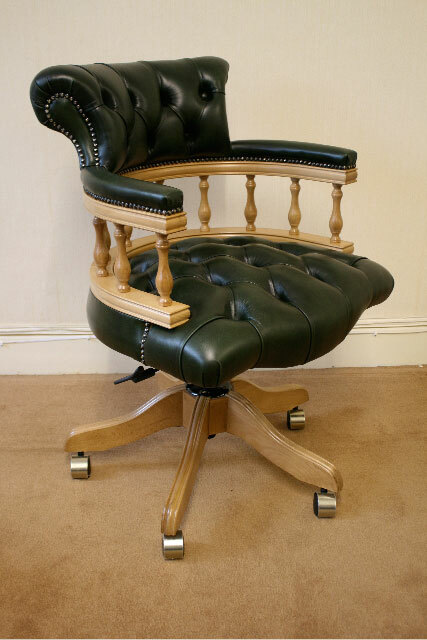 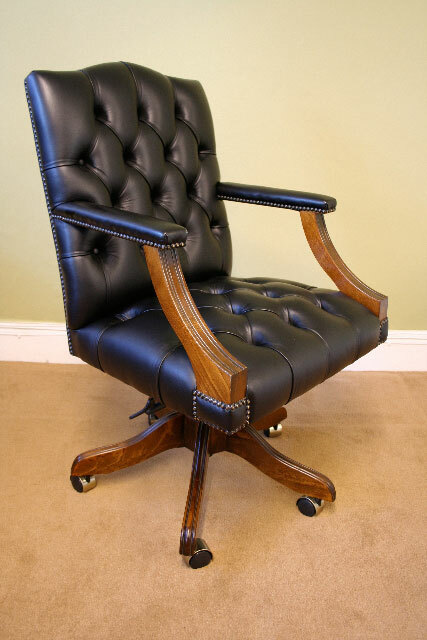 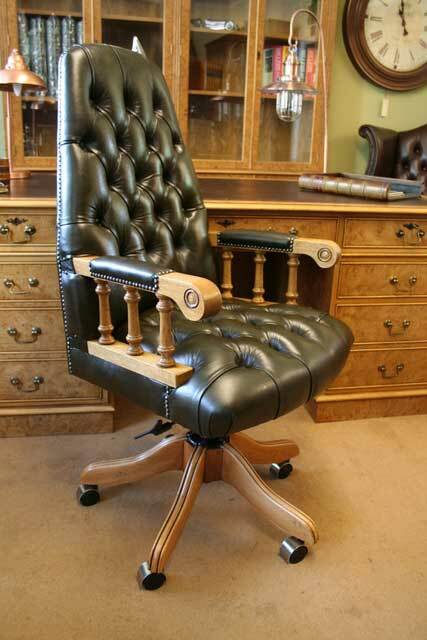 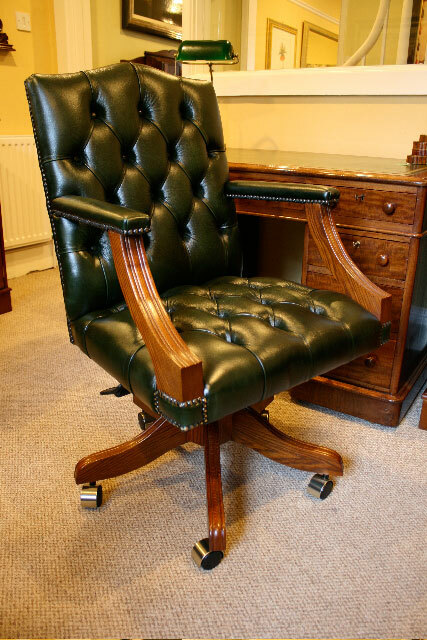 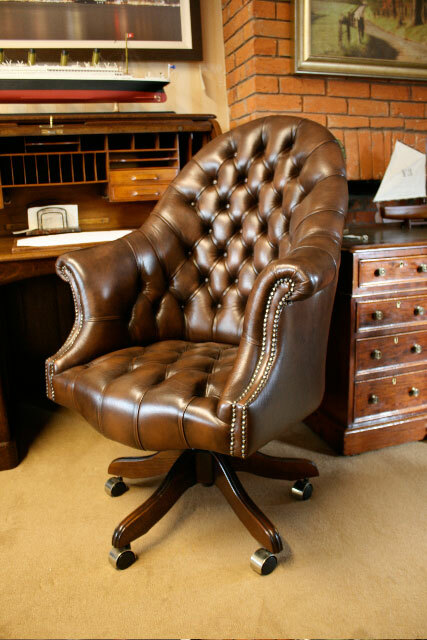 The impressive Directors Chair has graced many Homes, Offices and Boardrooms for Centuries, with it's comfortable supporting high back and shaped padded arms. 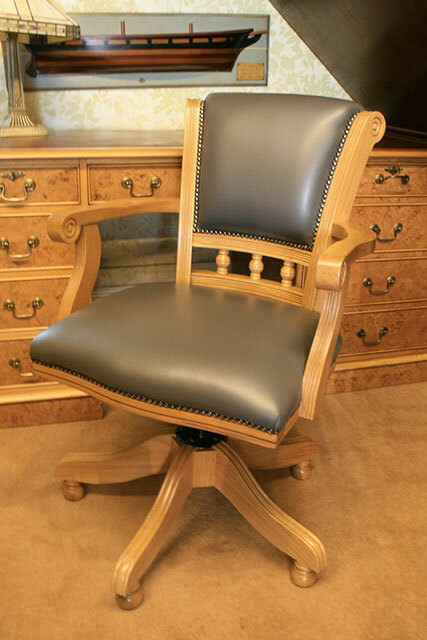 Choice of upholstery options and a wooden chair base that can be polished to any wood shade, with a Gas lift and Tilt mechanism.